The first kākāpō eggs in three years have been discovered by rangers on Codfish Island/Whenua Hou. The two nests that have been found so far belong to Lisa, an experienced kākāpō mum, and Tumeke who has bred before but had infertile eggs. Both Tumeke and Lisa have laid two eggs each – but it will be another week before it’s known whether their eggs are fertile. 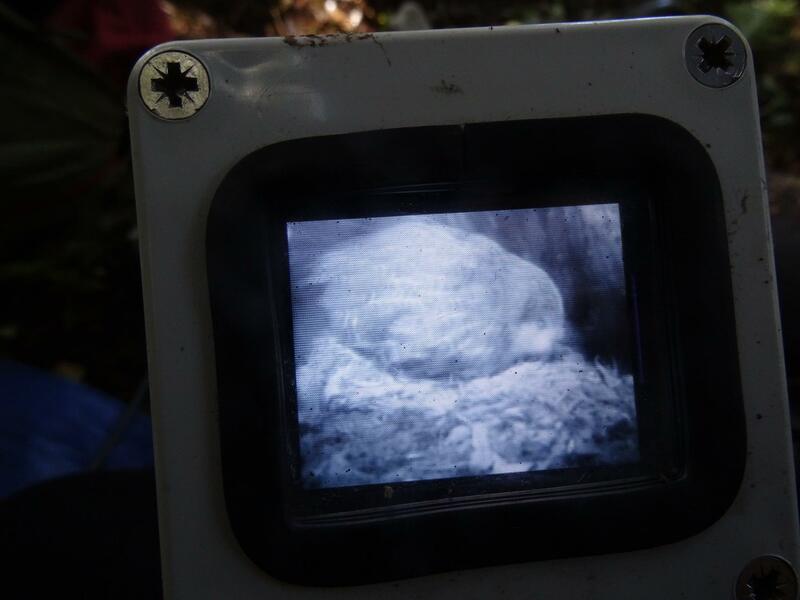 Today’s photo of the week is of Tumeke being viewed on her nest through a video monitor. Kākāpō breeding and nesting on Whenua Hou is triggered by the amount of rimu fruit available on the island, as it is the food that the mother kākāpō relies on to feed her chicks. There has been no breeding during the past two summers because of poor rimu crops. The Kākāpō Recovery team is preparing for the possibility there could be up to 15 kākāpō nests this season. Hmmm. Interesting idea, but no! 😉 Infertile eggs are removed from the nest (the shells are stored for research purposes). If a female has a complete clutch of infertile eggs then she will either be given a ‘dummy’ porcelain egg, so that we can retain her nest and she can be given another female’s chick to raise (this shares the load and reduced the burden on the other mother), or she will be left with no eggs and hopefully may re-nest. I’ve just found this blog and glad I have. I keep my fingers crossed for this breeding season will be a big success. Hopefully you will raise up young healthy chicks!!! I wish you a lot of rimu seeds, no mice nor other rodents and good weather. I’m really fascinated by this unique green parrot. I will certainly follow the breeding season on Sirocco’s Facebook homepage. By the way, please could you tell me when and where Sirocco might be on tour this year? We will come to New Zealand in November 2014 and I really wish to have an encounter with a kakapo. I still have the book “Hoki” from 1997. In the year 2000 Dr. James Higham (University of Otago, Lecturer for Tourism) asked me while we were on holiday what else would be important to improve the tourism in NZ: I answered that for me it would be the greatest to see a kakapo alive. So GOOD LUCK for this important season! !